Turning the calendar from August to September certainly means a lot in the meteorological world. As far as things you’d notice: days start getting shorter, leaves may start changing color, and best of all, average temperatures begin their slow, steady fall into winter. However, sometimes Mother Nature lags in terms of seasonal expectations. Such was the case in our spot for warmest spot in the U.S. this September – Johnson City, Tennessee. It was their warmest September on record at 8.3 degrees above the long term monthly average. All 30 days featured temperatures above average including 5 days that were at least 10 degrees above the normal mark. Johnson City would see ten afternoon highs in the 90s making for the 2nd most in any September. 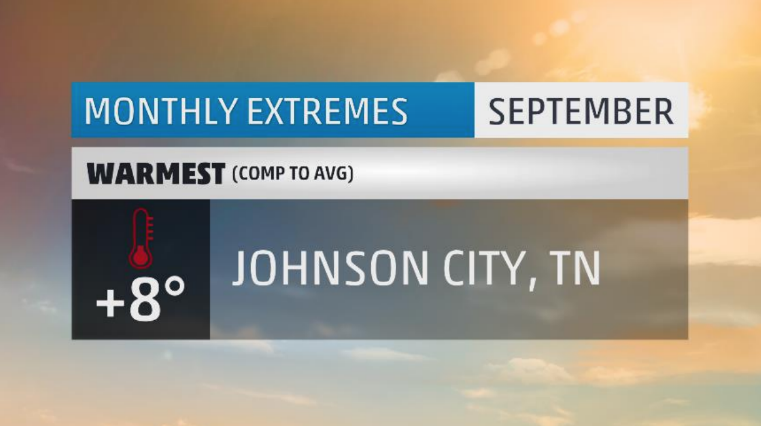 In fact, Johnson City had more 90-degree days in September than they did in August! In a month where average high temperatures range from 84-74 degrees, 19 days saw highs warmer than 84 degrees. But the nights were just as sultry. Typical September lows range from 60-49 degrees, but this September saw 29 lows warmer than 60 degrees. That made for the warmest average September low temperatures on record and the greatest number of above average lows for any month in the calendar. With four overnight lows at 69 degrees, they would set their 7th warmest September low temperature as well as see the highest number of September nights with temperatures so warm. The coolest low temperature Johnson City saw was a measly 59 degrees – that’s the warmest monthly minimum for any September. They would set eight record lows and zero record highs. The urge to leave the windows open at night in Johnson City is certainly at an all-time high. Look at this sea of orange and red dots covering the East Coast. 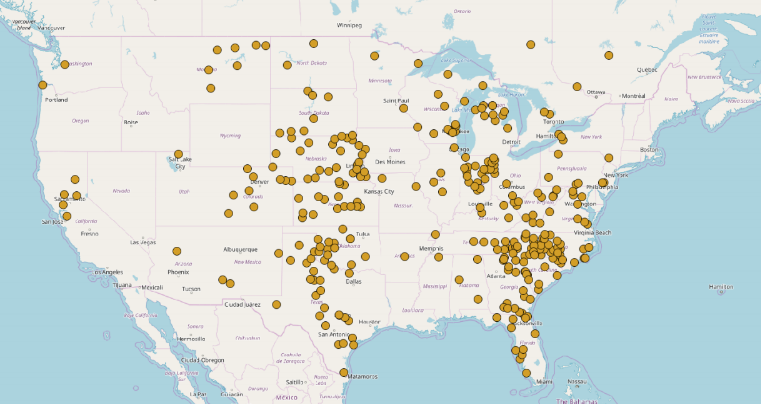 Each dot here represents a city that had one of their top 10 warmest Septembers on record. 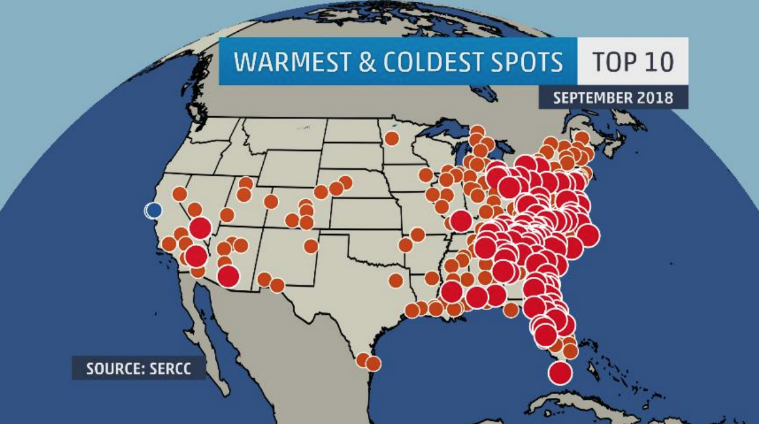 The bigger red dots are places that had their warmest September on record. Of close to 800 cities, 297 had one of their top 10 warmest Septembers. Of those cities, 113 had (or tied) their warmest September, including places like Atlantic City, Norfolk, Tampa, and Key West to name a few. No surprise here. Another month comes and goes with a majority of U.S. cities seeing above average temperatures. 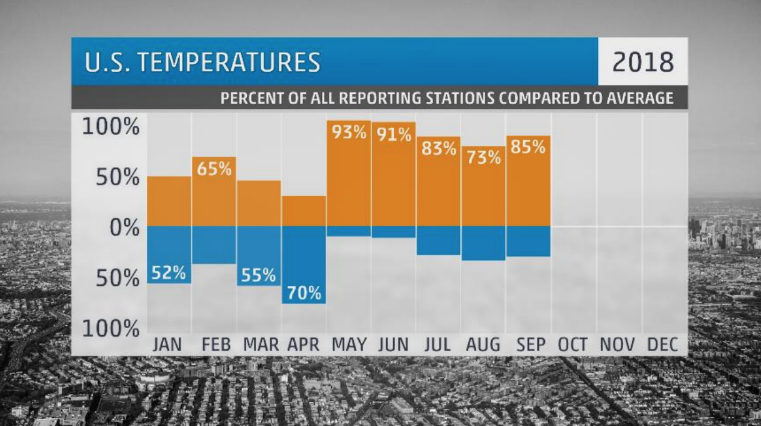 This September, some 85% of cities ended the month above their long-term temperature average. This marks the fifth month in a row with similar statistics. Then there’s this map. All the dots on this map represent places that had a warmer September than their August or July. By the way, that’s 318 cities! Trust me, though – it was cold somewhere. Through much of the late summer, cold air begins to build in, well, generally cold regions. This begins in the Arctic and slowly spreads equatorward into Siberia and Canada. Eventually, those along the northern tier of the Plains and Rockies start feeling cold intrusion by September, and it can be quite jarring. Take our spot for coldest in the U.S. for example. 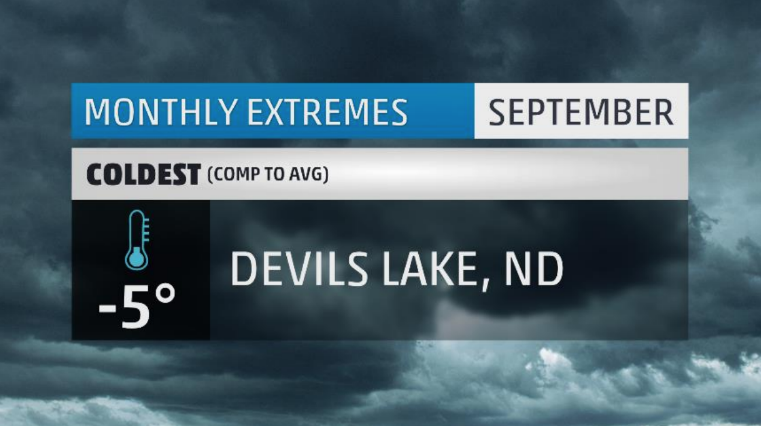 Devils Lake, North Dakota just had their coldest September on record. The month featured 23 days with below average temperatures including seven that were at least 10 degrees below average. Check out this list of cold accomplishments they saw this month: most number of days with highs below 70 degrees (23), most number of days with highs below 60 degrees (12), most number of days with highs below 50 degrees (5), most number of days with lows below 50 degrees (24), most number of days with lows below 40 degrees (13), and finally, most number of days with lows at or below freezing (2)! Whew… They would set new records for the top four coldest September high temperatures in 2018 with the coldest being 41 degrees. They would also set their coldest September low on record at a chilly 27 degrees. Devils Lake would end the month setting 9 cold high temperature records and another 9 low temperature records. And if all that wasn’t enough, they saw their 2nd earliest freezing low for any cold season. But hey, no snow – so there’s that. First, a disclaimer. In a month where Hurricane Florence ravaged the Carolinas with storm surge, wind, and torrential rain, you would expect the wettest place in the U.S. to be one of the many affected by the storm. And you would be right, but with an asterisk. See, these stats that I collect to make these monthly reports are from official National Weather Service observation stations. 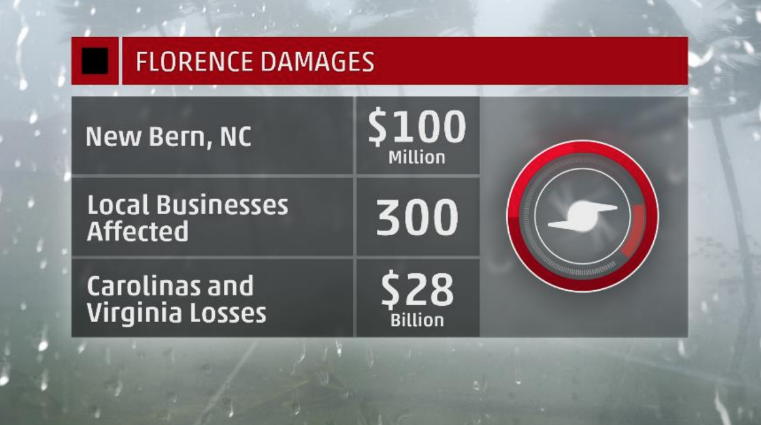 While some places in Florence’s path saw rainfall over 30 inches, these were not part of the official data network. 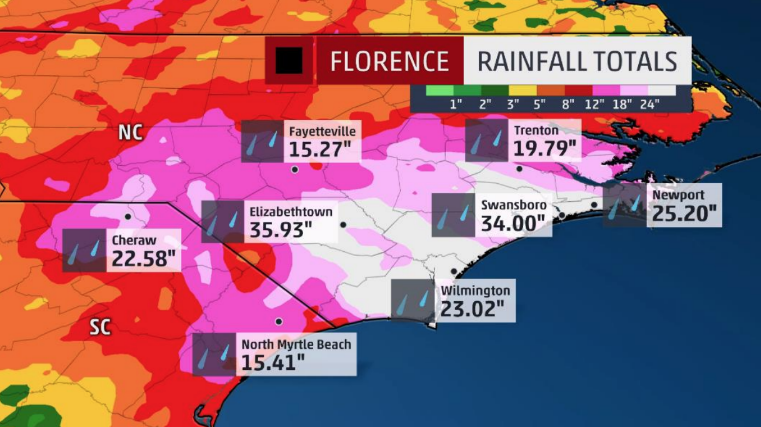 So we will definitely touch on Florence’s impacts later on in the article, but our wettest spot surprisingly goes to someone else. We’re heading to the Lone Star state for this one. While everyone was watching the impacts of Hurricane Florence unfold in the Carolinas, coastal Texas was dealing with their own awful weather disaster. A pattern developed which brought moisture onshore from the Gulf of Mexico, some with influence of tropical waves, which led to day after day of soaking, flooding rains. 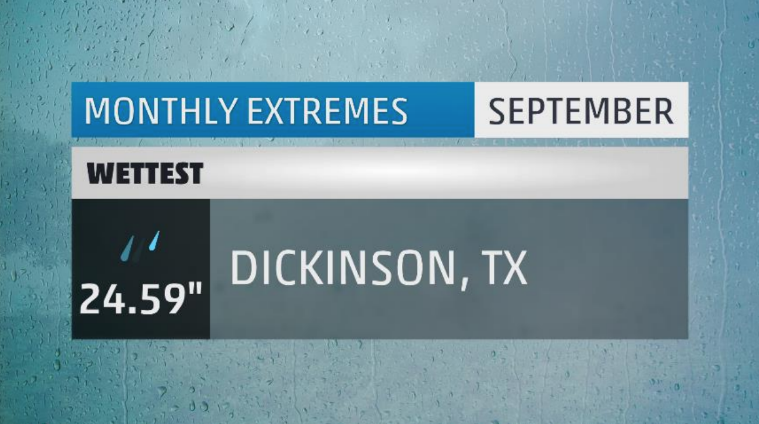 The wettest of the wet was Dickinson, Texas. With almost 25 inches of rain falling in the month, they would set their wettest September on record. This would also go down as their second wettest month on record just behind August of last year when Harvey devastated the region. This September featured 23 days with measurable rainfall – that’s the most not just for September but for any month on record. Ten separate days saw at least an inch of rain! This includes their now 2nd wettest September day which dropped close to five inches. The month saw the end of an incredible 19 day streak with rainfall which is the longest such streak on record. To put things into perspective, even without a land falling tropical system, the Texas coastal region would see 200-400% of their normal September rainfall. There was truly no escape from the rain for these Texans this September. You can see the two distinct clusters of green dots on this map: one in Texas and the other covering most of the Mid-Atlantic. The Texas cluster was all due to an open Gulf of Mexico and a weather pattern that repeatedly brought wave after wave of moisture into the state. The other cluster is mostly due to Hurricane Florence, which brought torrential rains to the Carolinas and up the Appalachians into New England. 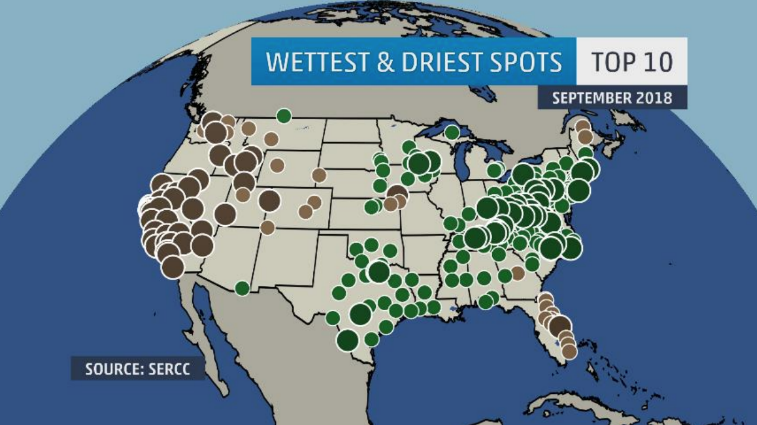 In all, 202 cities would have on of their top ten wettest Septembers on record. And then there’s Florence. 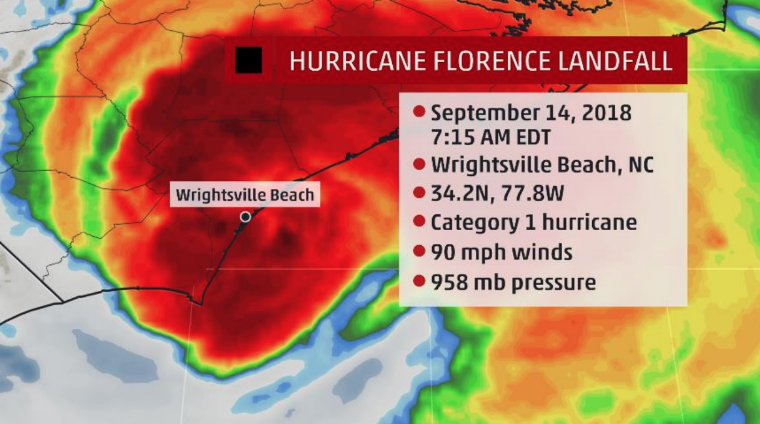 Florence would make land fall as a Category 1 hurricane on September 14th with immediate coastal impacts of storm surge and strong winds. What would unfold in the coming days would be a storm that stalled over the Carolinas dumping catastrophic amounts of rainfall. Select spots like Swansboro and Elizabethtown would see well over 30 inches of rain. The area as a whole saw a widespread one to two feet of rainfall from Florence. After the rain had ended, a secondary problem was just starting. All of that rainfall had to go somewhere, and that place was into the many creeks, streams, and rivers that weave their way through the Carolinas. Days of major river flooding followed, costing even more people their homes, businesses, and in some cases their lives. 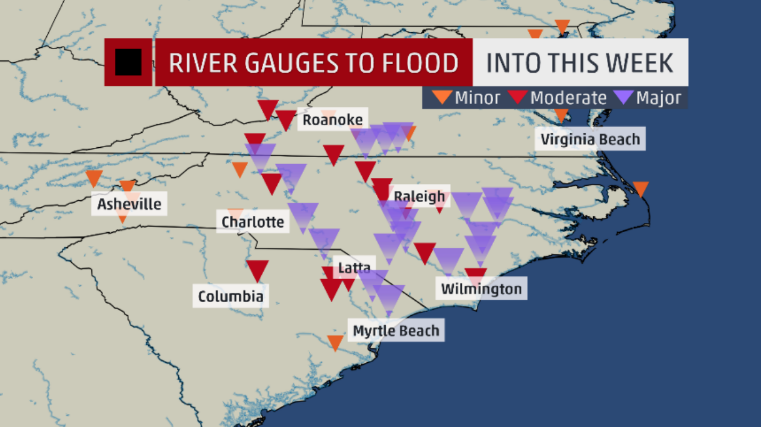 Many local rivers would set their all-time highest crests during Florence breaking records just set a few years prior during Hurricane Matthew. 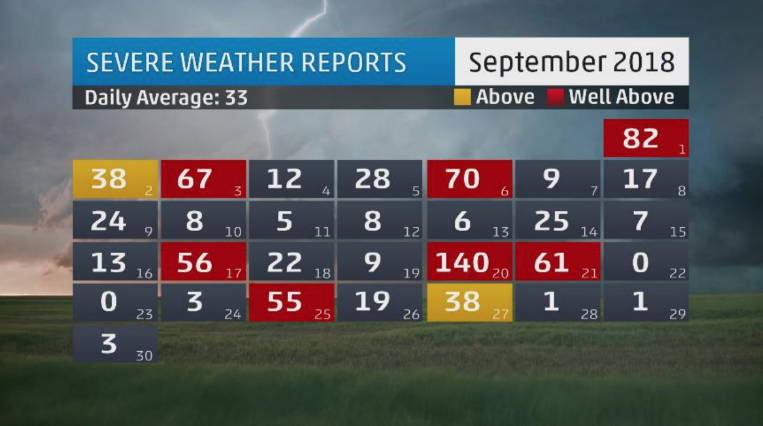 September was actually quite the active month for severe weather. Ten days saw above average reports of tornado, severe wind, and large hail reports. 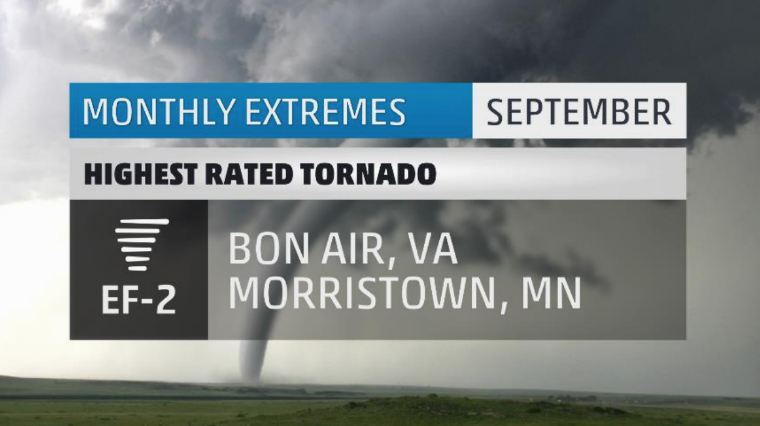 The month would end with just shy of 100 tornadoes making it one of the most active months for tornadoes this year. 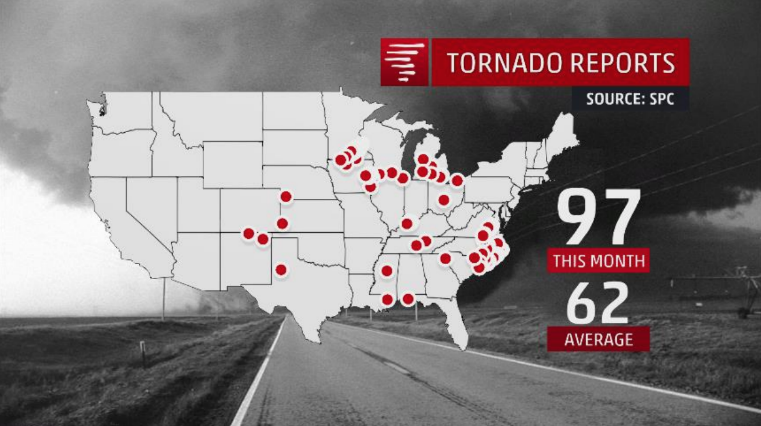 The bulk of tornado reports came from Florence and from a severe complex of storms that tore through the upper Midwest. The two strongest tornadoes were rated EF-2. One, in Bon Air, Virginia, was due to the land falling effects of Hurricane Florence. The other, in Morristown, Minnesota, was due in part to a long-lived cluster of storms that produced a number of tornadoes across Minnesota, Iowa, Illinois, and Michigan. Baseball sized hail fell from a lone thunderstorm that formed over Holbrook, Arizona. A tornado which passed by the airport in Faribault, Minnesota clocked a wind speed of 110 MPH. That’s EF-1 strength. Look what’s back! It took until the absolute last day of September, but we managed to land a city with measurable snowfall in September. The “big” winner: Billings, Montana. 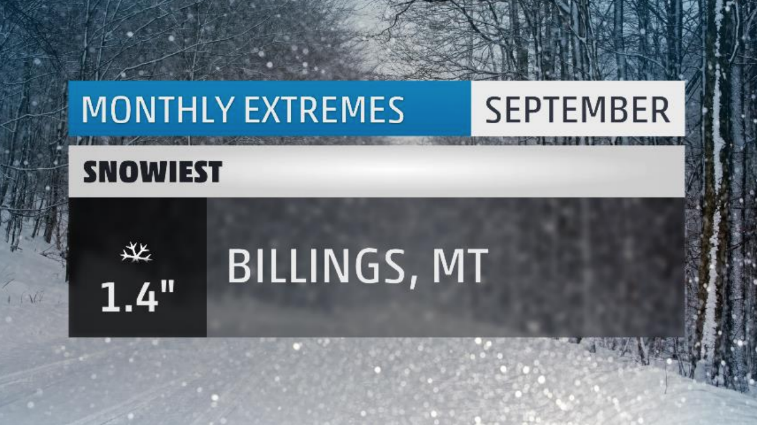 At 1.4 inches, this makes for Billings’ 16th snowiest September on record. It’s also the 17th September out of the 84 on record to see measurable snow – so it’s not super common. The snowiest September saw 9.3 inches back in 1984. This was Billings’ first September snow in nearly 20 years! Their earliest snow on record occurred on September 7th, 1962 when two inches of snow fell just four short days after Labor Day. All of this is just a friendly reminder that WINTER IS COMING! To the sunny West Coast we go where one particular city had wall-to-wall sunshine the entire month of September. 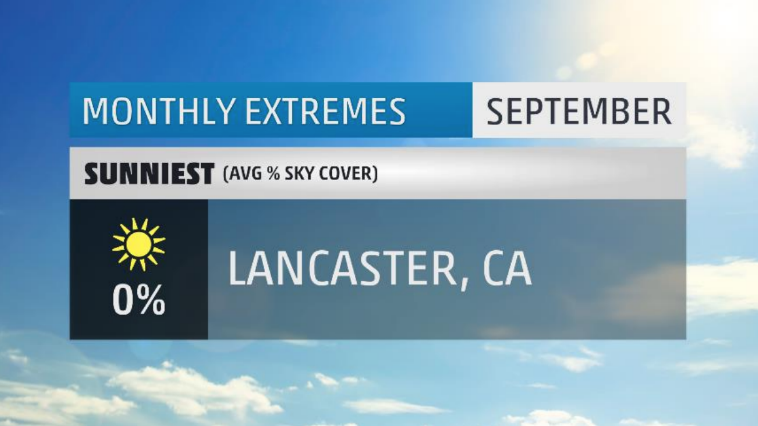 That’s right; Lancaster, California went 30-for-30 on sunny days this past September. All of that sunshine made for an incredibly warm month. There were 27 days where the mercury climbed into the 90s. They would end the month about three degrees above average. No surprise here, there was no precipitation recorded during the entire month. Typically, September is their sunniest month of the year. Go figure. From full sunshine to incredibly gloomy skies we go and hop back into the Lone Star State. Thanks in part to the onslaught of wet weather the persistent weather pattern provided; it’s no shock that there were also a ton of clouds. 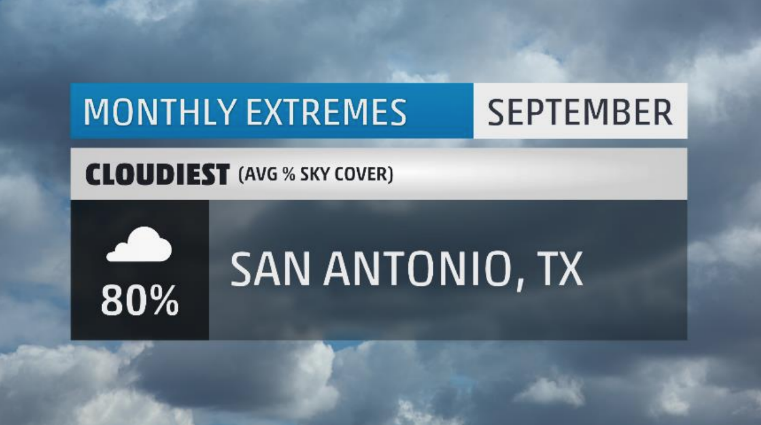 San Antonio, Texas would bear the brunt of the gray skies with 18 cloudy days. Five of those 18 were completely overcast, and they would muster exactly zero sunny days all month. Those 18 cloudy days were also 18 wet days. A record setting 16.86 inches would fall as a result. San Antonio’s cloudiest time of the year is typically in January. Just another example of Mother Nature not getting her calendar straight. There you have it, the extremes for the month that was September 2018. Make sure to check back next month to see what October has in store! What weather extremes did you face in September where you live? Let me know in the comments below.